For more than 50 years, New York City's tallest residential building was a mere 632 feet. But supertall spires will set a new standard five times this decade. Illustration of the consecutive towers that claimed the record for New York’s tallest residential building. Four years after the Sherry-Netherland impressed New Yorkers in 1927 with a spire reaching 560 feet above the ground, the Waldorf Astoria topped it. For more than a half-century, the 632-foot luxury hotel-apartment combination on Park Avenue endured as the city’s tallest residential structure. These days, the once-towering Waldorf could be considered quaint, not to mention squat. At least five buildings this decade will set a new standard for height among New York City residential structures, according to researchreleased this week by the Skyscraper Museum. 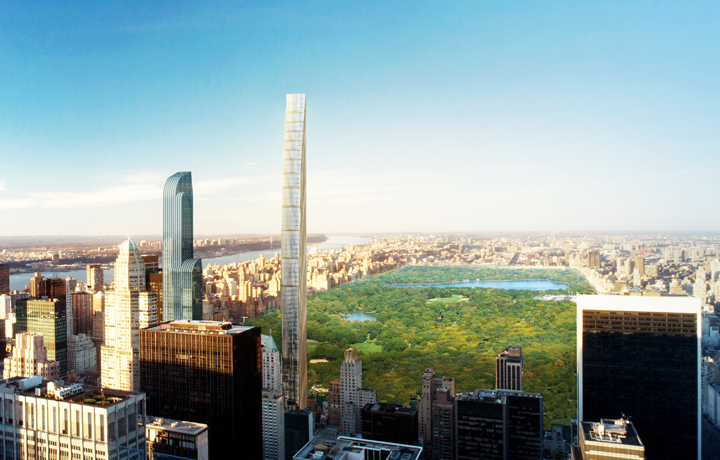 The tallest of them all will be the Central Park Tower, which is to reach its 1,775-foot peak in 2019, ending the projected one-year reign of 111 W. 57th St. Both buildings will have retail space on the lower floors and hotel rooms above, but most of their height will be devoted to apartments. The current record holder, One57, last year became the city’s first residential tower to break the 1,000-foot barrier. The supertall 432 Park Ave., however, will smash that mark when it opens this year with a 1,396-foot peak. From 2011 through 2014, 8 Spruce St. claimed the top spot, but the Frank Gehry-designed rental building will increasingly find itself looking up at condominiums across Manhattan. The Waldorf’s 51-year record stood until 1982, when Harry Macklowe’s Metropolitan Tower crossed the 700-foot plateau. CitySpire blew by the 800-foot mark in 1987. Both had offices on their lower levels, but most of their floors were apartments. Donald Trump erased any doubts about what qualified as the city’s tallest residential building in 2001 with his monolithic Trump World Tower. The spate of supertall spires is being powered by improvements in building techniques and by the stratospheric prices being paid for large dwellings with commanding views. Many of the buyers are foreigners who perceive Manhattan real estate to be a safe long-term investment. The rapidly changing skyline has raised the hackles of neighbors of Central Park because of the lengthy (if thin) shadows the towers will cast over the city’s premier green space at certain times of the year. Community Board 5, the Municipal Art Society and a cadre of Manhattan elected officials have been particularly vocal. But the Department of City Planning said this month it has no plans to change the zoning to prevent more tall, slender buildings from going up—and up, and up. 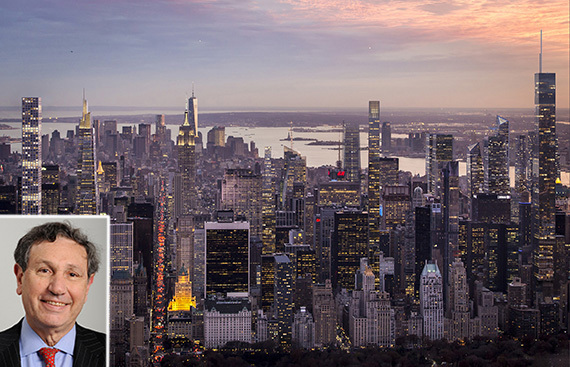 Ceruzzi Properties and Chinese partner SMI USA are planning a condominium project at 520 Fifth Avenue with a total projected sellout of $1 billion, The Real Deal has learned. Town Residential will be marketing the condos, through its Town New Development division. Ceruzzi and SMI, otherwise known as Shanghai Municipal Investment, paid Joseph Sitt’s Thor Equities $325 million for the property and another 60,000 square feet of air rights in a deal that closed late Tuesday, CEO Lou Ceruzzi told TRD. Sitt bought the site, located between 43rd and 44th streets, for $150 million in 2011. Ceruzzi said 520 Fifth will have three levels of retail at the base, topped with 180,000 square feet of luxury condominiums that could fetch north of $1 billion. He declined to say how many condos the building would have, but he said the top floors would be combined into “larger penthouse apartments.” Ceruzzi said “in all probability” the building would also include a hotel with 150 to 180 rooms. The property is currently vacant, after Sitt demolished two prewar buildings on the site when he bought it from developer Aby Rosen and Tahl-Propp Equities. In December, Thor filed an application for permits for the mixed-use building. Ceruzzi and SMI are now following through with those plans. Sitt put the property up for sale earlier this year through HFF, asking $350 million. Thor is marketing the retail space at the base of 520 Fifth, including 85 feet of frontage on Fifth. “We are hoping to achieve $1,000 per square foot on the first floor,” Ceruzzi said. 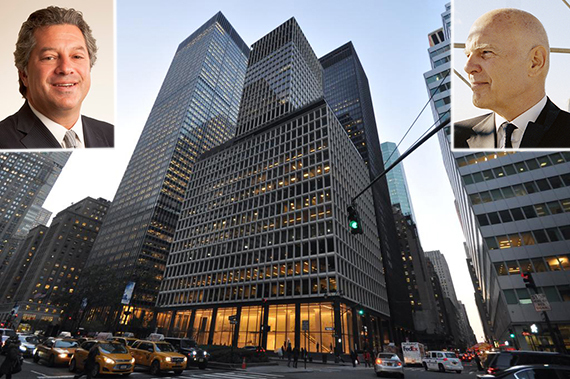 520 Fifth is the second joint venture between Ceruzzi and SMI, which entered the New York market 10 months ago. Ceruzzi and SMI are also developing a 52-story hotel tower at 138 East 50th Street that is slated to have 764 rooms. “New York is the best market in the United States,” said Tom Tao, president of SMI USA. The two firms are actively looking for a third, large-scale investment to make together, Ceruzzi said. In addition to its investments with SMI, Ceruzzi is also partnering with Kuafu Properties and Stillman Development on a $340 million, mixed-use development on the corner of 86th Street and Lexington Avenue. The project will include 50 new luxury condos. It’s been known for months that the new tallest building in New York City outside of Manhattan was being planned for right behind the now-landmarked Long Island City clock tower. Now, new renderings published by 6sqft give a better look at the design of the 915-foot-tall tower, known as Queens Plaza Park, that will be sandwiched between Bridge Plaza North and Northern Boulevard on 41st Avenue. The residential building at 29-37 41st Avenue will encircle the 1927 clock tower, and will be at least 70 stories tall. The tower’s being developed by Property Markets Group and the Hakim Organization , and is designed by SLCE Architects (like just about everything else.) The building is slated to have 800 units and open in 2019. Milan-based Est4te Four is developing a 1.2 million-square-foot commercial project along the Brooklyn waterfront. Rendering of Red Hook Innovation Studios. The Italian company that has plans to develop a sprawling office complex along the Red Hook, Brooklyn, waterfront is seeking a partner willing to invest $100 million or more in the project. Milan-based Est4te Four has hired Cushman & Wakefield, led by Bob Knakal, Cushman’s chairman of investment sales, to market a 49% stake in the development, called Red Hook Innovation Studios. When completed, the project would be the biggest block of newly constructed office space outside Manhattan to be available for rent. According to previous reports, Est4te Four plans to spend $400 million to create the five-building complex, which would total nearly 1.2 million square feet. The project likely will be built in phases over five years and could break ground next year, when leases at the existing properties on the site expire. The developer, which also has projects in Los Angeles, London and Milan, spent about $61 million over the past three years assembling six adjacent properties located west of Ferris Street, from Coffey to Sullivan streets, in Red Hook. The sites are occupied by either warehouse properties or parking lots. Est4te Four plans to preserve and restore 202 Coffey St., a two-story, approximately 170,000-square-foot warehouse that’s over 100 years old. The rest of the site would largely be rebuilt. The company is expected to erect four office buildings of up to seven stories. Est4te Four would also create park space, a promenade along the water and retail space at the base of the buildings. Red Hook Innovation Studios will be designed to appeal to creative, fashion and tech businesses, which increasingly are calling Brooklyn home. Similar commercial destinations in the borough have been successful in drawing tenants. Just south of Red Hook, for instance, Industry City, a 6 million-square-foot collection of former industrial buildings in Sunset Park, has attracted big names like Time Inc. Meanwhile, the owner of Dumbo Heights, a group of contiguous buildings joined by sky bridges in Dumbo, has nearly filled the complex with several tenants in recent months. Near its big office project, the Italian company is in the process of converting a former six-story warehouse at 160 Imlay St. into a 70-unit luxury condominium. Patty LaRocco, a broker with Douglas Elliman who is handling sales for that project, said that more than 60 of the building’s units are in contract, with prices averaging more than $1,100 a square foot–among the highest ever netted for residential space in the neighborhood.